Mummy, Wife and Chaos: Printed trousers Day and Night 4 looks. Right now you can pick up some bargain pieces in H&M and this is just one of mine that I wanted to share. 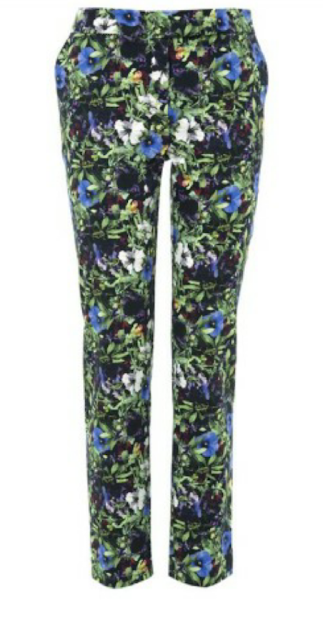 I picked up these beauty's in store for just £7.49, that's cheaper than Primark! I've styled them in a few different ways to show how wearable they are, I would do more but then I will run out of looks to blog later! 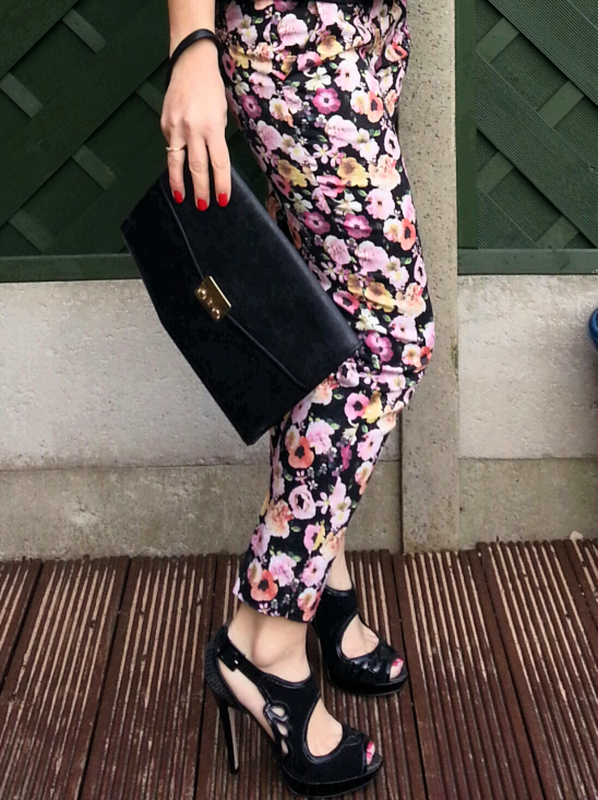 First up is for a evening out worn with a Black Topshop Peplum , Kurt Geiger heels and a envelope bag. Next up is a daytime look with a Topshop sweatshirt, Topshop black flats and a denim jacket from Primark. When summer finally arrives I wear my denim jacket alot, especially with maxi dresses and skirts. Next up I have swapped the top for a Topshop slub jersey T-shirt (primark do a great version like I'm wearing here, obviously any would match just pick out a colour from the trousers. I'm just showing with this mustard colour. For a edgy look go for a biker jacket (mine is Topshop similar here) and then a funky statement necklace, this one is Primark for a price tag of just £4. A statement necklace is great to funk up any T-shirt. Or if thats too dressed up still and you want something for the school run days like I do today, then swap for a very on trend lightweight khaki parka again mine is Topshop and they have one very similar here. Failing that Next have this one which I really like. Thanks! I've had this tshirt in the back of wardrobe years, I've hardly worn in it as felt it's a very wintery colour! Love them on you, the four styles are great on you. 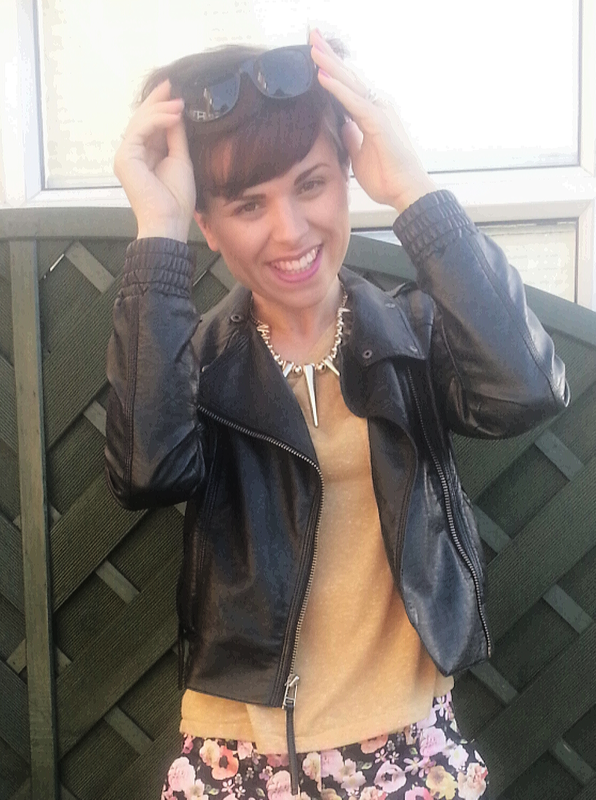 I soooo love that Primark spiky necklace, so cool and soo me! Grab one its such a bargain!